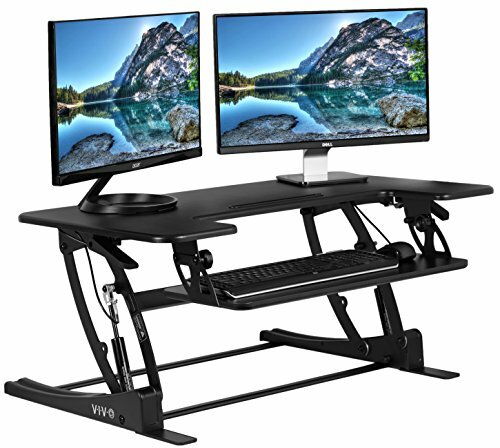 Enhance your work experience with DESK-V000V, VIVO's height adjustable tabletop desk. This dual-tiered platform sits on top of your current desk and gives you the benefit of standing or sitting on demand. The keyboard tray is removable for user preference. Transitioning between sitting and standing throughout the long work day provides numerous health benefits for the body such as increased blood flow and reduced aches and pains. Standing throughout the day also helps the mind stay alert and productive.The top platform rests 6.5" from your desk's surface in sitting position and 17" when fully extended. The top surface measures 36" x 22" allowing you to customize your work area and create the workflow you need. Additionally, the 10.5" x 25" lower deck holds keyboard and mouse side-by-side and elevates in sync with the top surface, providing a comfortable workspace. The weight capacity for the entire desk is 33 lbs. If you have any questions about this product by VIVO, contact us by completing and submitting the form below. If you are looking for a specif part number, please include it with your message.